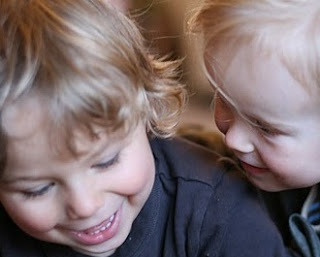 The Foundation of Social Interactions - Joyful Toddlers! The foundation of positive social interactions between children is to teach them to notice how other children are receiving their actions, and to listen to each others’ requests. The first piece of this is to help youngsters start to notice both positive and negative responses to their actions. This is especially important when children are touching one another, as it’s often hard for young kids to realize what the results of their actions will be, especially the under-twos, who often like the feeling of grabbing or hitting. I know one little boy who always wanted to hug his friends, but it often turned into a death-grip, leading the recipient of the hug to struggle, and both children fall down. He wanted to connect with others but doesn’t know how. I worked with him for a long time, teaching him to do a quick hug-and-release. When he was successful, I’d say, “Look, she’s smiling! She liked that!” Or, if it went on too long, I’d say, “Oh no. She’s pushing you away. She’s saying, ‘please stop.’” Eventually, he was able to notice on his own whether others liked it, and others were able to say “please stop” on her own. Note: this technique for death-grip-hugs will only work if what he’s wanting is connection. If what he’s actually wanting is physical stimulation, it’s much more effective to pick him up and spin him around, hang him upside-down, or lay him on the floor and roll him over and over across the room. That way he can get what he’s looking for from someone who is enjoying the interaction. The other piece to the foundation of positive social interactions is to make sure that children respond to their friends’ requests. The biggest piece of this is to listen for whenever a child is saying “Stop,” and make sure that the other child stops. At Rainbow Bridge, STOP MEANS TAKE YOUR HANDS AWAY. So, I keep my ears sharply tuned, and whenever I hear someone saying ‘stop’ (or preferably, ‘please stop’), I’ll turn around and watch. If the child doesn’t stop, I’ll move in and say, “Oh! I hear Jessie saying stop!” Then, if they don’t stop, I’ll remind them, “stop means take your hands away.” And, if they still can’t do it, “It looks like you need some help taking your hands away,” and I’ll help them. There doesn’t have to be any blame, it’s just them learning to follow the rules, just like any other rules, such as staying at the table while we’re eating, or only going downstairs with an adult.